16 July 2018: we regret to announce that Professor Emeritus G. Blaine Baker has passed away. Leave your thoughts and memories of Professor Baker in our Guest Book. Donations may be made to the Blaine Baker Entrance Fund. Professor Baker receiving the Durnford Teaching Excellence Prize in 2005. Professor Baker taught administrative law, legal history, and contract law. 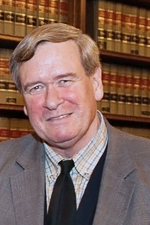 His research focused on intellectual history and history of the legal professions. He won publishing awards from the Canadian Law and Society Association, the Canadian Association of Law Libraries, the American Society for Legal History and the Canadian Historical Association. Professor Baker held visiting appointments at the University of Chicago, Osgoode Hall, and University of Toronto law schools. Professor Baker served as Associate Dean (Academic) and as Associate Dean (Graduate Studies) of the Faculty of Law, and was thrice awarded the John W. Durnford Prize in Teaching Excellence. He also acted per diem for the Attorney General of Ontario as a Superior Court Mandatory Mediator and a License Appeals Tribunal arbitrator. Commercial law, administrative law, and legal history. Teaching: Administrative process, Canadian legal history, contracts, judicial review of administrative action, legal theory. Research: Legal historiography, history of the professions, and heritage preservation. 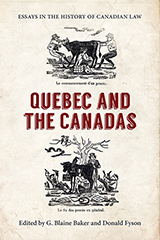 "The essays in this volume deal with the legal history of the Province of Quebec, Upper and Lower Canada, and the Province of Canada between the British conquest of 1759 and confederation of the British North America colonies in 1867. The backbone of the modern Canadian provinces of Ontario and Quebec, this geographic area was unified politically..."